It’s not truly summer until the middle of June, but it climbed into the 90s here yesterday and is supposed to be just as hot today, so I’m calling shenanigans. If I need two showers a day just from standing outside, it’s summer. I’m not trying to rush it, because last year and the year before it got into the 110s more than a few times. I hate summer, fyi. I hate the sun, the heat, the painful freeze of air conditioning, the sweat, the mosquitos, all of it. The only thing I like is that it stays light out until at least 8:30 (but it does that in Paris in April, so whatever, Paris wins forever and ever, amen). Without being too much of a downer, here are some basic summer essentials to add to your wardrobe. Good luck, folks. I hope we make it to September without melting. Bonus: everything is under $100! Well, except for that duffle bag, but only by $16, and you’ll need a good weekender for all those trips to the beach. You will. Not me. Girl, I am all about summer. Love the heat, love the food, HATE the bugs. And I have that Splendid shirt in four different colours. Originality is not my strong suit. Happy Friday! i love everything. i would be happy to buy one of each – maybe two of those black dresses because i would probably wear it everyday. the only thing i’d have to eliminate is that skirt. not because i don’t think it’s adorable and it might even make my white look like they had a little color but because it’s white and i have kids and i am clumsy – i’d ruin in about 1 minute tops. Well, I’ll take all of it. Thank you very much. I hate summer too, fyi. I just can’t stand being hot. Thank goodness it doesn’t get too hot, or humid, in these parts. I would go mad. As it stands, our home – built in the 1920’s – has no central air or air conditioning, so it’s fans galore up in here, which helps only a little when the temps are high. I have no business complaining as you (and Lauren) have it much worse. So, I’ll just zip it now. I do love the longer days and that everyone seems a little bit more relaxed and live concerts in the park and dinner picnics. See, some positives. Have a wonderful weekend, Erin! Cute! 3&9 especially. I love that it gets darker later too. Hope you have an awesome weekend Erin! I’d take the shorts, tank and sunglasses. Great essentials list. I can’t believe you hate Summer! 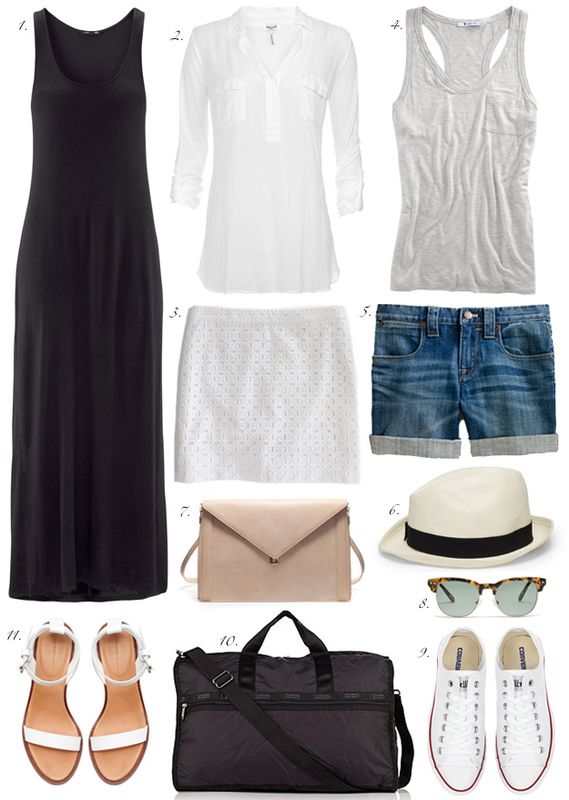 Your read my mind – these are my summer basic to a T! I had to avert my eyes when you said you hated summer (*shudder*). It hurts my eyes to even repeat that. Mostly because I am so deprived of heat/sun/vitamin D etc here. Up until last week, I was still wearing my winter wool coat. Tell me about melting – I always forget every year how much I hate Florida due to its sweaty humid muggy summers. None of my clothes look good in Florida summer. Although – I could use some more sandals like those white ones. Contemporary but super practical for the sweat that these months bring. I do hope I make it to September. But most likely it won’t cool off until January. Le sigh. I will just have to come visit PA + NY again!